INDIANAPOLIS -- A group has won the battle to stop the U.S. Department of Veterans Affairs from clearing a forest of trees at Crown Hill Cemetery to build a monument. The Department of Veterans Affairs purchased the 14.75 acres from Crown Hill Cemetery in 2015, and they were going to turn it into a veterans cemetery for cremated remains. 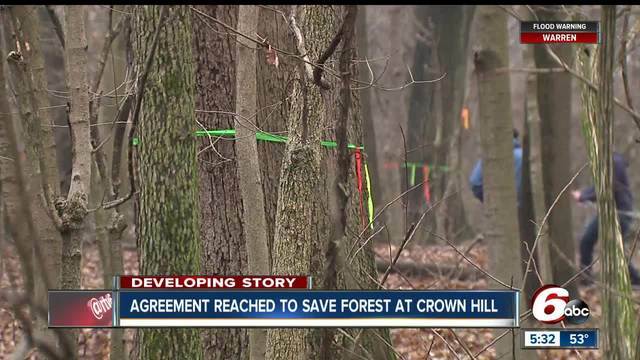 The agreement between the VA and Crown Hill will allow the cemetery to be built on an adjacent parcel of land that is owned by Crown Hill, keeping the centuries-old forest from being destroyed, according to a statement released by Senator Joe Donnelly (D-IN). “I am pleased that the VA and Crown Hill have come to an agreement to pursue a land swap that would allow the project to move forward without impacting the forest. This project is about our veterans, who deserve access to burial sites closer to their communities and their families. Keith Norwalk, President of Crown Hill Cemetery, said they are proud to help the VA continue their tradition of honoring the sacrifice of Indiana veterans. Mayor Joe Hogsett said the agreement would ensure that future generations can enjoy the old forest. “Today is a great day for the people of Indianapolis, whose voices have ensured that future generations can enjoy an old-growth forest which represents a unique piece of our city’s natural heritage.